Now it’s about Derrick Rose and his sprained/turf toe for the Bulls. 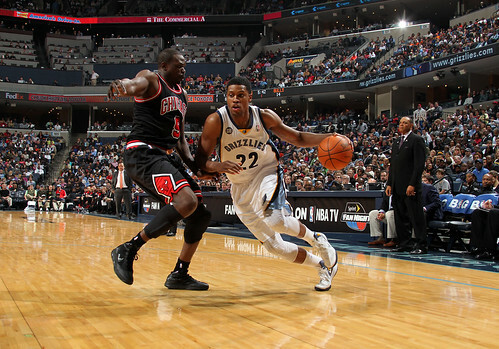 Forget the 102-86 pummeling the Bulls absorbed from a hot Memphis Grizzlies team and falling to 12-3 in the centerpiece Martin Luther King Day game in Memphis Monday. It was a day to ponder a great dream that still strives for reality and acceptance. For the Bulls, it also remained a day to have faith in what they might accomplish without their leader. Rose sat out for the second time in the last week with a toe injury he describes as an old turf toe problem and which the team refers to as a sprained toe. I am no doctor—though my college nickname was Doc, really—it’s probably obvious now Rose needs some time off. To have faith he is doing the right thing for his team in the long run while in the short run, at least not immediately given Monday’s results, his teammates can sustain. Like Dr. King once said, faith was taking the first step even when you didn’t see the whole staircase. The Bulls have two days off after playing Phoenix at home Tuesday, and there would seem no reason to play Rose against the Suns at this point. If Rose had missed just that Washington game and then returned like he did, leading the Bulls to wins over Boston and Toronto averaging 21.5 points and nine assists, you’d say he would keep playing. But once it becomes an every day question whether he can play you take the decision out of Rose’s hands. The kind of injury he has generally requires rest. And given this season for the Bulls is more about the playoffs than the regular season, it’s time to rest Rose at least the next three days. Given Cleveland and Charlotte, whom the Bulls face Friday and Saturday, are not exactly making statements for a playoff matchup you might think of giving Rose a week off. Though in rookie Kyrie Irving the Cavs have a tough point guard worth watching. A game like Monday’s when the Bulls fell behind by 27 points in the third quarter before making a run to within nine early in the fourth before the Grizzlies pulled away again is one example of the obvious. Clearly, the Bulls miss the production of Rose, who Monday was named both Eastern Conference Player of the Week and to the USA Basketball team to try out among 20 players for the final 12 roster spots. 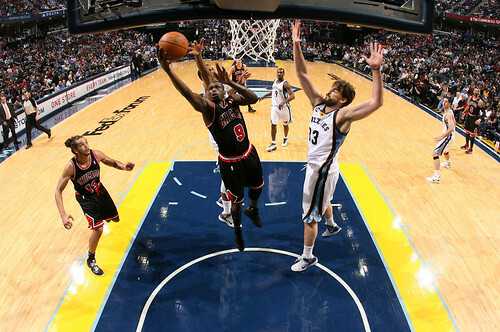 The Bulls were led by Luol Deng with 20 points and C.J. Watson with a nice comeback from his elbow injury with 17 points. So it’s all the more reason to rest Rose now with his regular backup returning. These next four games are all against teams with losing records through next Monday. The following week starting in Miami the Bulls play nine consecutive road games, and you don’t want Rose uncertain at that point. Especially with backcourt mate Richard Hamilton still out with a groin injury, Rose’s absence obviously makes scoring more difficult. But even if Hamilton returns, and nobody is quite sure when, the Bulls still don’t have a player who truly creates off the dribble and draws defense like Rose does. That changes the entire dynamic of the game, enabling the Bulls easier rebounding position as the defense rotates toward Rose, for one thing. After outrebounding their last 11 opponents to move into the league lead in rebounding, the Bulls were pounded on the boards by the Grizzlies 46-34. Rose is the team’s only true point guard as both Watson and third stringer John Lucas are shooting point guards. So the Bulls had just 12 assists on 33 field goals, an unusually low percentage for a team that came into the game sixth in the league in assists. It also becomes much more difficult for everyone else to get shots with the defense able to stay home more. So not one Bulls starter shot 50 percent for a team coming in ranked in the top 10 in shooting. Lucas had that huge game in place of Rose against the Wizards, though who doesn’t. But Watson last season had 33 points in Denver with Rose out. 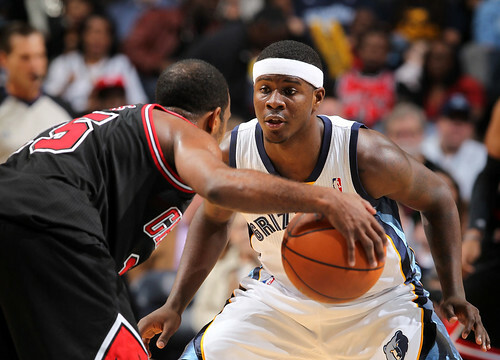 Watson was crucial in the third quarter in leading the Bulls’ comeback with nine points in less than eight minutes. He also went to the free throw line nine times, as many as the entire Grizzlies team in showing aggression in his return. But this Bulls team revolves around its own sun, the sparkling hot spot of Rose. Although Bulls coach Tom Thibodeau handles it professionally in not giving anyone excuses and allowing players to feel sorry for themselves by saying it’s “next man up,” Rose’s health transcends everything else the Bulls are doing. While Rose likes to say he has “an old school mentality” and doesn’t like to miss games, the time has come to allow him more time to heal as fully as possible. Granted, these sorts of traumas can develop any time and will in a season with so many games in a short period. But the opportunity is there now to find a week where Rose’s absence may not be so devastating after finishing the tough nine games in 12 days stretch and moving to the top of the league. Rose was only declared out during pregame warmups, and it’s not like that bewildered the Grizzlies. Thibodeau, having spent time in Boston, is something of a Bill Belichick disciple with a football mentality. You keep your opponent in the dark. So you’ll rarely see much updated Bulls injury information. The Grizzlies also came out with some revenge in mind. The Bulls beat them 104-64 in the United Center New Year’s Day in a game they led by 46. The Grizzlies, at least. Though it was Memphis’ shooting that was extraordinary with Rudy Gay and recently acquired Marreese Speights combining to hit eight of nine shots, and not many good ones, in the first quarter. Coaches always like to believe when another team shoots well it’s their poor defense. It’s always a way to push the players to work harder. But Gay, especially, was making some ridiculous shots. I know he’s a great athletic talent. But he takes the game too casually, and then he’ll throw up some one-on-one rainmaker, and they were all going in. Speights recently was picked up from the 76ers just for second round picks with a reputation for not working much. He wasn’t much of a fit with a Doug Collins team based on defense and grit as Speights likes to shoot jump shots. But when he makes them as he did Monday it looks good. Actually, the Bulls were in the game early thanks to Carlos Boozer, who snagged a tough offensive rebound (he would end with a team high seven rebounds) and was fouled and scored on a pair of jumpers and a flashy full court drive and finish after he made a steal. He had 10 points in the first quarter and the Bulls were within 16-14 with about eight minutes gone when Speights threw down a big slam dunk on an O.J. Mayo pass. Then Gay followed with another after John Lucas was pressured and lost the ball. It looks like Lucas was now scouted as the Grizzlies were all over his dribble. Plus, with Rose out Memphis was able to play the passing lanes aggressively without worrying about the driving lanes and slapped several balls loose. 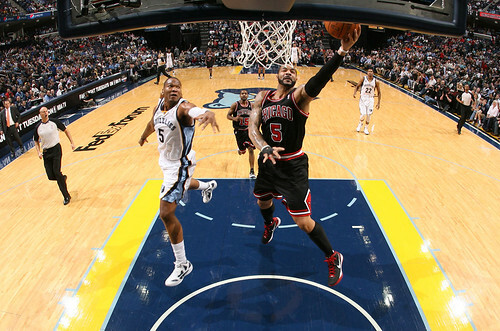 The Bulls added to Memphis’ ease with their own indolence. With several opportunities to go back door to counter the Grizzlies’ overplaying, the Bulls didn’t react, again perhaps the liability of not having a true point guard other than Rose. Gay, who led Memphis with 24 points, hit two more high arcing rainbow jumpers after a Marc Gasol drive past Boozer and it was 28-21 Memphis after one quarter. Still no sign of a blowout. Not yet. 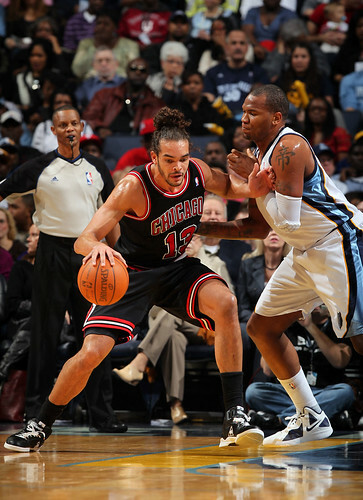 It was another tough game for Joakim Noah, who was trying to defend Speights with Boozer on Marc Gasol. When Speights began hitting his jumper with Noah off him, Noah had to come out and then began to get beaten on the drive in what became a bad matchup for him. Speights had 16 points and 12 rebounds. The Bulls hung in there early in the second quarter with Watson returning after being injured in that New Year’s Day game and shooting the first two times he touched the ball and then drawing a foul. Watson looked good with a nice dropoff pass right after that for a Taj Gibson dunk. Watson can pass, but it’s usually not one of his top few options. Meanwhile, everything was going for Memphis and it seemed more serendipity to me than soft defense as reserves like Josh Selby and Quincy Pondexter were making long jumpers. 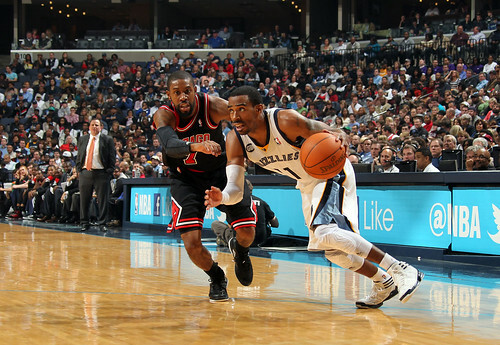 And Conley, who was really good, breaking the Bulls pressure constantly. Only when he went out with fouls were the Bulls truly able to get back in the game with a trap. That was late in the third quarter. 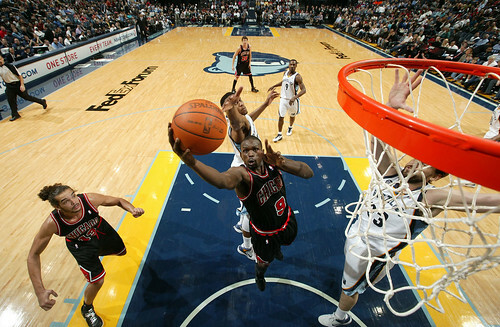 After staying with Memphis into the second quarter and down eight with under four minutes left in the half, the Grizzlies closed 13-1 with Gay throwing in a well defended jumper over Deng, Conley with a long desperation three as the clock expired, Gasol with a follow after a Noah turnover and blocked shot against Noah and Gay posing in the corner after a three to suddenly close the half with a run to 58-38 Memphis. The Bulls weren’t getting backside help, which is rare, on drives and generally seemed overwhelmed. The halftime speech apparently did no good as the Grizzlies jumped on the Bulls behind Gay with Gasol beating Noah with a running hook on a switch and getting fouled. 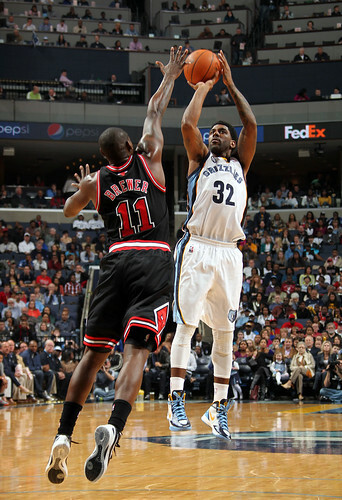 Gasol added 19 points and 10 rebounds and the Grizzlies went ahead 69-42. But the ultimate measure of a man, we know, is not where he stands in moments of comfort and convenience, but where he stands at times of challenge and controversy. It’s generally a credit to this Bulls team that they never give up, and with defensive replacements Omer Asik and Taj Gibson joining an aggressive Watson and Deng the Bulls made a run back to get within 77-66 on a Gibson follow tipin as the third quarter ended. Those wild shots that were going in earlier now were not, which seemed to energize the Bulls to intensity their defensive efforts. When Gibson scored on a little baseline move, it was 81-72 Memphis with nine minutes left. You can make that up. But in the long run you don’t often make up deficits of nearly 30 points, and there is the fourth in five nights Tuesday. These are especially tough choices in this unusual season. But Thibodeau doesn’t give up on much. He knows all progress is precarious, and the solution to one problem brings us face to face with another problem. Conley came back for the collapsing Grizzlies and knocked in an elbow jumper. Gibson followed an Asik runner with a slam dunk to keep it in single figures. Gibson appeared to get a block on Gay, but it was called a foul and he made two. Deng got stripped and then Gibson, too. Conley found an alley and drove all the way for a score and Gasol beat Gibson twice to push Memphis’ lead up to 94-75 with about six minutes left to effectively end it. Thibodeau finally emptied the bench with 3:18 left, and the Bulls headed back home for Phoenix Tuesday to see what they have left and who they have playing. And where they’ll go next. We must accept finite disappointment, but never lose infinite hope. Dr. King told us that.